Many CX professionals are now building sophisticated models of customer journey maps. However, sophisticated things are usually difficult to operationalise. This article is about the fourth attribute. Quick wins are important. They prove upfront the ROI and boost morale. Quick wins allow you to get the support to continue the CX journey, which is a decisive factor in influencing the successful rate of CX initiatives. Many companies complain that they can’t obtain quick wins for their CX initiatives. This is mostly a problem created by the Conventional CX. 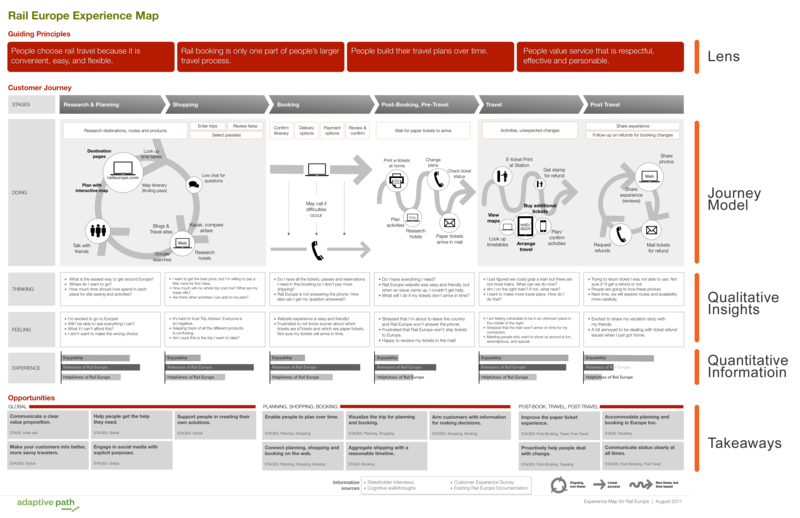 Simplify and operationalise customer journey map. Many CX professionals are now building sophisticated and fancy models of customer journey map. However, sophisticated things are usually difficult to operationalise. To reverse any complication, we ought to simplify these models in order to put them into operations. Take the Starbucks case and NPS as an example. 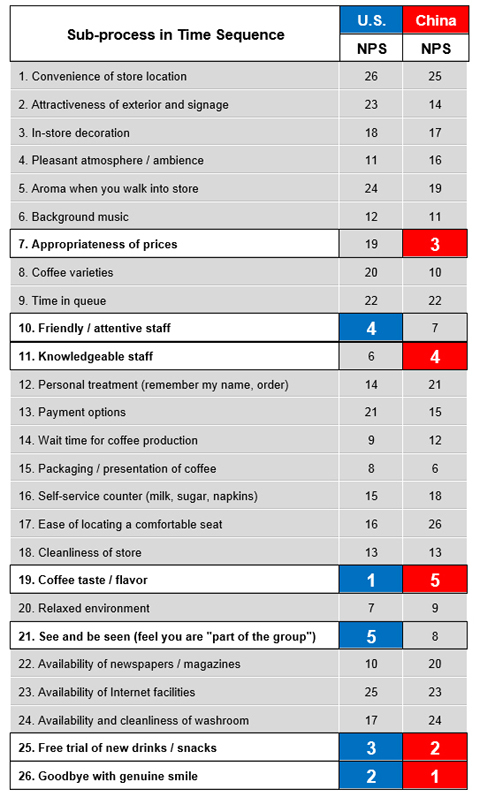 We correlated the satisfaction rating of each sub-process during the in-store experience to the NPS (net promoter score) given by the Mainland Chinese and American customers for a global research [note 1]. Figure 1 lists the X-VOC Data [note 2] – the importance ranking of each of the 26 sub-processes in driving NPS. With 26 sub-processes, the importance rankings literally range from 1 to 26, with 1 being the most important and 26 being the least important factor affecting NPS. The ideal candidates are 'Goodbye with genuine smile' and 'Free trial of new drinks/snacks' – the relatively easy targets – you would soon be able to set up inexpensive pilot projects to test out and enjoy a quick win, and most importantly, you connect CX to the target business result – in this case, driving NPS. Ordinary brands not ready for a CX breakthrough. Ordinary brands ready for a CX breakthrough. However, transforming the culture or changing the DNA of an existing – especially the well-established – organisation is much more difficult than a new company. A. Extraordinary brands. Even great brands make mistakes sometimes – e.g. unable to fulfill their promises and deliver a debranded experience. For instance, a Real CX detects the De-Branded Valleys of IKEA Mainland China and recommends a non-biased solution to convert them into a Branded Peak and a branded experience. Furthermore, resources are put to their best uses. For example, the No. 1 repeat purchase driver of IKEA is ‘Product pricing’ [note 3], for Starbucks, it is ‘Coffee taste/flavour’ [note 4], while for Louis Vuitton it is the ‘Exclusive feel of wearing/owning LV products’ [note 5]. Resource allocation can be well aligned with the target objectives by identifying the respective business drivers. * This is the fourth article of the “Stop Practicing the Conventional Customer Experience Management” series. There is a total of five articles in this series. X-VOC (Voice-of-Customer @ Experience) Data are generated by customer research to obtain the satisfaction ratings and derive the importance levels of each sub-process (touch-point experience) and attribute during a touch-point experience (total customer experience). While I agree with your approach, you make a number of contentions that I can't agree with. Yes, quick wins are important. And yes, it's certainly possible to make journey mapping overly complex. But where do you find that "The Conventional CX always leaves out 'price' and 'product' in their customer journey maps?" I don't know who "The Conventional CX" is - but a review of journey mapping shows that many do, in fact, involve price and product. Why wouldn't they? A blanket statement that maps don't include product or pricing assumes all maps are the same. 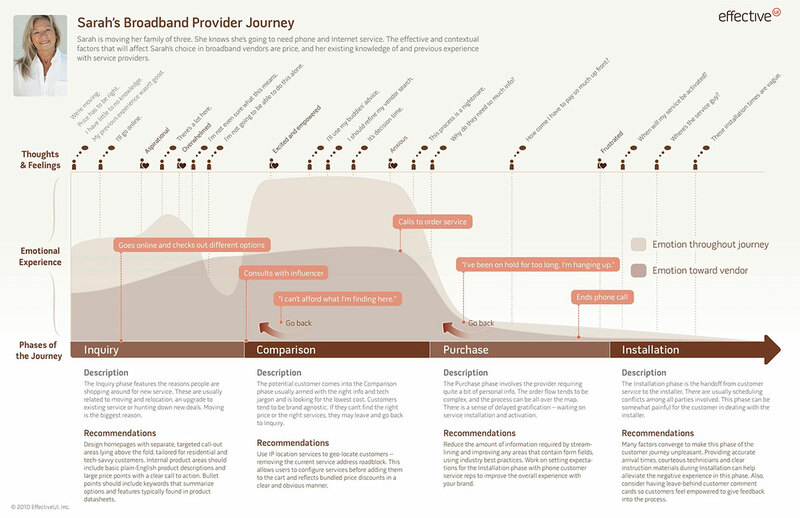 Looking at some leading journey maps (such as some of ours found at https://heartofthecustomer.com/4546-2/) show that product and price are pretty common. - Adaptive Path's classic Rail Europe map (https://uxfindings.files.wordpress.com/2012/02/raileurope_cxmap_final-co...) shows both. - Sarah's broadband map (https://cloud.netlifyusercontent.com/assets/344dbf88-fdf9-42bb-adb4-46f0...) is pre-sales, but does include pricing concerns. I could go on, but most have stopped reading. Quantitative research is good and important. But your blanket accusation of journey mapping is inaccurate. It’s a good thing if more and more companies are including ‘pricing’ and ‘product’ in their customer journey maps. It would help to lay the foundation for migrating the Conventional CX to a Real CX.